An innovative & natural solution to a common problem amongst amputees. The C.I.E.P. is a polymer product designed for cushioning the cut bone of the amputee - a problematic area for all amputees. By applying exoskeletal principles endoskeletally, the C.I.E.P. kills the pain problem at the point of contact. The C.I.E.P. is applied during the amputation surgery, provides comfortable shock absorption for the amputee, protects the amputated bone, and seals the bone marrow. All of these benefits begin immediately after application and last a lifetime. The end result: a healthier, happier amputee living a more fulfilling life! Diabetes affects 25.8 million americans, 8.3% of the U.S. population. It is an epidemic and the leading cause of lower limb amputations. The estimated cost to American private & public insurance agencies is $12 billion annually. Below-knee amputations are the most common amputations, representing 71% of dysvascular amputations; there is a 47% expected increase in below knee amputations from 1995-2020. There are more than 1 million annual limb amputations globally -—one every 30 seconds -— even more troubling, the International Diabetes Federation (IDF) predicts that current global prevalence of diabetes will burgeon from 285 million to reach 435 million by 2030. The C.I.E.P. is an initial product in a line of engineered cushioning & pain releiving polymer devices. 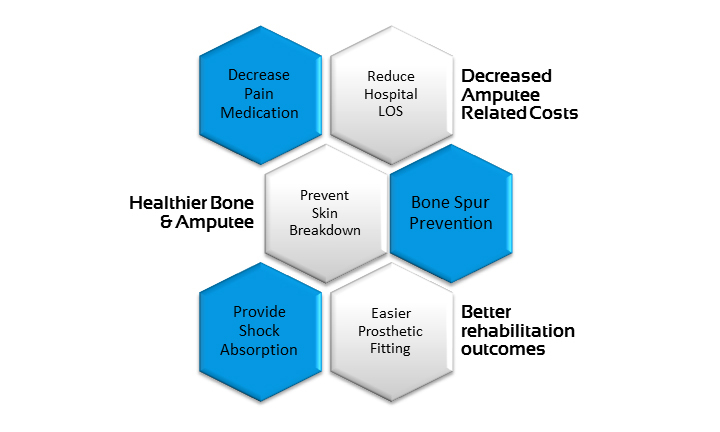 Future product versions have already been designed that include additional post-operative benefits. Furthermore, we have several other proprietary designs for application in the amputee, prosthetic, and rehabilitation arena. At Advanced Amputee Solutions, we are analyzing the lives of amputees and developing logical solutions for their problems; we are relentlessly problem-solving so we can all live more fulfilling lives.